Sound clips to be sent to one of three devices? Thread: Sound clips to be sent to one of three devices? - a Bluetooth earpiece (worn by one of the players). So a sound clip will only be heard on one device simultaneously. The room is running already with a pc playing the audio files. The files have specific channels, and the channel specifies which device will play the sound. We want to move the room elsewhere, and change this system. The PRJC TDM Board comes to mind. But, you'd have to provide more details on your interfaces. This board looks great, I'll order them right away. Thanks! What I simply wanted to do, now that the boards arrived and the soldering can begin, is to read WAV files from the SD card on the Teensy 3.6. 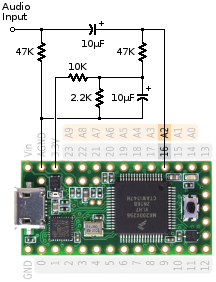 Depending on some values in an array, the sound will be directed to one of the three outputs on the TDM Board. I have looked around on the forum, could not find any earlier attempt to do this... It must be possible, right? You'd set one of the amplifiers' gain to 1.0 and the others' to 0.0. The mixer is included in case you need to convert stereo wav files to mono. Set gain on inputs 0 and 1 to 0.5. Pity, we got three boards from OSH Park and all the parts from Digikey. But the chips are too fine for us, we could not solder them properly. Somebody offered to solder them for way too much money, so I'm going to settle for separate set of Teensy + Audio Adapter Board. If somebody wants to try to fix them for us, or if somebody is interested in the parts, let me know! We are located in Utrecht, The Netherlands by the way. For soldering fine pitch, I use Kester 331 solder. It has lead, so not sure if you can get it in Europe. Don't both with lead-free, it's really difficult. Use tin-lead solder for this sort of hand soldering. Also use Kester 2331ZX liquid flux, and a microscope with ring light. It makes a huge difference. The liquid flux is amazing at allowing the solder to flow nicely. If you can buy Kester 331 & 2331ZX, and get a magnifier and bright light, I highly recommend giving it a try. The right solder and plenty of liquid flux really does make this so much easier. The one downside is you *must* wash the board is hot water to fully remove the flux chemical. The baking the board for 15-20 min is needed to fully dry. I'm actually tempted to give it another try. I can find the Kester 331 through Mouser in a .015 diameter. The flux is not easy to get here. Mouser offers ChipQuik CQ2LF, a water soluble flux pen. Would this match, or shouldn't I mix those chemicals? What temperature would you set the oven for baking? Get the real Kester 2331. I have a 1 gallon jug. It wasn't expensive. I use 170F for baking (~77C), which is a little on the high side but that's the lowest setting on my oven. I've seen 150F suggested (~65C). Also can't emphasize enough the importance of bright lighting and a magnifier. More than any other factor, use of a good magnifier (true optical, not a laggy webcam) will assist your hands to deal with the small pitch. Last edited by PaulStoffregen; 01-29-2019 at 07:06 AM. Thank you very much for your advice, Paul! I just soldered my first SMD chip. Did not think I could do it. \o/ As suggested, I used a couple of bright LEDs around my board, a magnifier and the Kester solder. Two boards are working! The picture is showing them, one with a Teensy 3.5 and a poor man's breakout board. Glad you got them up & running! Now that everything works, there is a new idea of adding a microphone as an input. - Choose another type of microphone to the input channels, the question is: which mic? - Use an I2S mic, like https://www.tindie.com/products/oneh...al-microphone/ Or would this interfere with the I2S pins used by the TDM board / CS42448 chip? This is not the real problem... I think the tdm input and the tdm output did not like each other, the way I connected everything. Starting a new thread.